In Kohaku, Sanke and Showa breeding, many koi turn out to have only a single red spot which is on the head. We call these koi Tancho, Tancho Sanke and Tancho Showa respectively and they are shown in Tancho class. The Tancho spot must be between the eyes and preferable perfectly round. It must not go back onto the shoulder of the koi or down to the nose of the koi. Red may not appear anywhere else on the koi to be shown in Tancho class. A sumi pattern may cross the Tancho mark on a Tancho Showa. 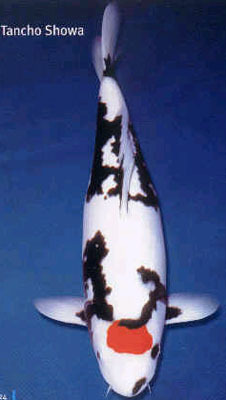 No other variety with a spot on the head may be shown in Tancho class. This includes Goshiki with red spot on the head, Bekko with black spot on the head and Ogon with orange spot on the head to name a few. With a "Red Sun" marking on head, and lacking other red on the body. Best if the "spot" is bright red, w/o bleeding color, and circular, centered on the head. All koi limited to only a single patch on the head Hi are called “Tancho” after the Japanese crane which is basically white except for its round, red crest. As the name for one of the variety groupings, Tancho refers to koi of the “big three” with red found solely in the characteristic head Hi. In a limited sence, it is used to refer to the “Tancho Kohaku”. Generally, top quality Tancho should have a large, perfectly round head Hi, although an oval Hi, if well shaped, is acceptable. Other shapes such as a heart, cross, square, and plum blossom can be found, but are not held in as high a regard as the round Hi. In no case however is Hi which extends over the shoulder, eyes, or lips acceptable. Also, the Hi should be deeply coloured, uniform and have a sharply defined edge. Since the head Hi should be as large as possible, a broad head is also preferred, but not of paramount importance. Of equal importance, however, to the quality of the head Hi, is the requirement that Tancho have unblemished, snow white skin. This is because the pattern is so simple, and the expanse of the white so extreme, that beautiful skin is necessary to provide the sharp red and white contrast. Tancho with a Shiro Bekko body are called “Tancho Sanshoku”. There should be no Sumi on the head, as this would detract from the round head HI. The Sumi should be ebony coloured, and the patterns, neatly defined. As in the Shiro Bekko, there should be a few Sumi strips on the pectoral fins to balance the body pattern. “Tancho Showa” have the characteristic head Hi combind with a Shiro Utsuri body. In this variety some head Sumi is allowable because the comparable Showa Sanshoku are suppose to have a V shaped head Sumi. Characteristic Showa Motoguro on the pectoral fins should also be present. There are other Tancho combinations such as “Tancho Goshiki” and “Tancho Ogon”, but these are rare.